#11 – What is the difference between someone who is doing the work on the property vs the person who works on the funding? You will know why it’s so important to have both of these sides to real estate investing whether you are new or experienced. What are the pros and cons of each of these two sides of real estate investing. Why are each of these sides necessary and how do they work together. You will have the answers to these questions and more when you listen to this podcast. #9 – Listen and learn as Peter and Jerry tell you exactly how to get Top Real Estate Agents to list Your Property for a reasonable flat fee. You will know why you definitely need a Real Estate Agent, how to choose a good Real Estate Agent and how you, as a real estate investor, are able to determine the maximum selling price for your investment property most quickly. 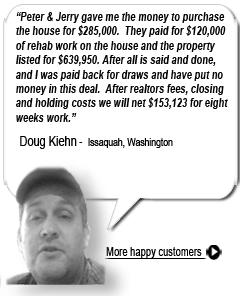 Lastly you will know exactly how to save money on their fees creating a win/win for both you and the Realtor involved. In today’s distressed real estate market where most people are concerned about long term ownership, real estate mentors Peter Conti and Jerry Norton are making waves with their “FlipGuys” podcast where they share the inside secrets to making quick profits by flipping houses and commercial real estate. The challenge for most people is they don’t have access to the money they need to make the “all cash” offers that today’s distressed marketplace is calling for. This was upsetting to Peter and Jerry because everyday regular people, just like Peter, a former auto mechanic, and Jerry, a former construction worker, who want to get into real estate investing have been locked out simply because they don’t the have funds to get started. Peter and Jerry’s free real estate training and other programs provide the step by step know how along with specific guidance on getting access to the the money and other resources most people need to profit from real estate today. 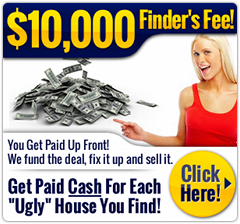 The step by step training you’ll find here allows you to partner with the nation’s top real estate experts and provides access to funding so you can make all cash offers – not only on homes but also on commercial real estate as well. Discover how to use our proof of funds documents and other tools and resources so you’ll have the credibility and power to get your offers accepted and close quickly on your deals. Peter and Jerry have successfully completed hundreds of fix & flip deals and they can provide you with the tools and coaching to run your real estate business with a systematic approach. Check out the free training resources, download the free Ebook, or register for one of our upcoming webinars so that you too can begin to profit from real estate without owning or managing anything, ever!